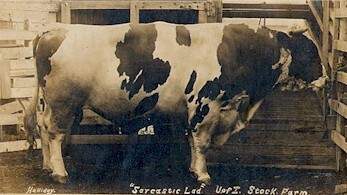 Holstein cattle were brought to St. Louis from a wide range of geographic areas. Though the numbers were strong, many entries had little hope of catching the judge’s attention, let alone winning a prize. It was said that each class had a large gap between the best of show and the tail-enders. Most classes’ quality dropped off significantly after 3rd or 4th place. A line of Holstein-Friesians on display in the great arena. 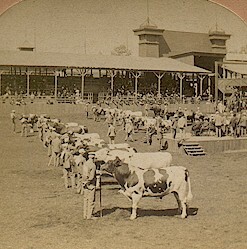 One very famous Holstein-Friesian, Juliana de Kol, was brought to St. Louis in hopes of bringing the next World’s Fair to her native state, California. Though she didn’t participate in the competitions, she was famous as the top recorded milk producer. · Group: Aged Herds: M. E. Moore, Cameron, MO. · Group: Young Herds: J. B. Irwin, Minneapolis, MN. · Group: Get of Sire: Missouri Chief Bassanio: M. E. Moore, Cameron, MO. · Group: Produce of Cow: Doc Kumer 6th Wayne: M. E. Moore, Cameron, MO. 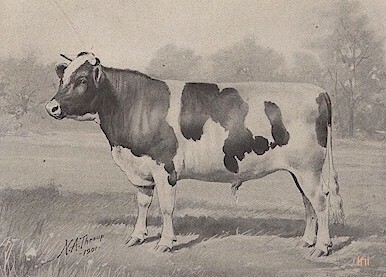 Sarcastic Lad was the champion Holstein bull. This photo was from ca 1908 when he was at the University of Illinois. References: Breeders Gazette, September 28, 1904, p. 543-544. World’s Fair Bulletin, November, 1904, p. 41. Photos from Irwin Collection and Report of the Kansas World's Fair Commission. This page was designed by Duane Nanneman and is maintained by Lyndon Irwin.